We’d love your help. 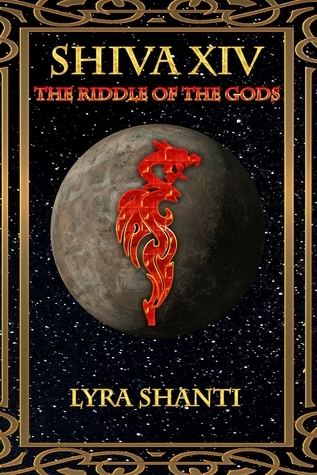 Let us know what’s wrong with this preview of The Riddle of the Gods by Lyra Shanti. To ask other readers questions about The Riddle of the Gods, please sign up. In this much anticipated third chapter to the popular Sci-Fi novel series, Author Lyra Shanti propels us forward on the exciting adventures of Ayn, Axis the Sarax, Reese and other favorite characters who discover new life paths as they come together in preparation of settling old scores and meeting their fates head on. In “Shiva XIV The Riddle of the Gods”, Shanti takes us deeper into the dark side of the Un Galaxy’s war between religion and science. Fates are determined and destinies fulfilled In this much anticipated third chapter to the popular Sci-Fi novel series, Author Lyra Shanti propels us forward on the exciting adventures of Ayn, Axis the Sarax, Reese and other favorite characters who discover new life paths as they come together in preparation of settling old scores and meeting their fates head on. In “Shiva XIV The Riddle of the Gods”, Shanti takes us deeper into the dark side of the Un Galaxy’s war between religion and science. Fates are determined and destinies fulfilled in this installment of Shanti’s series, and after sating themselves with the two previous novels in this series, readers will find a certain measure of closure and satisfaction when a new generation rises up to assume control of their home worlds. Plenty of action and adventure follows the main cast of protagonists as some come together, some drift apart, and some merely meet their fate. This story line is somewhat darker than the two preceding novels, and while some characters plan new vendettas and settle old scores, others suffer enslavement and undergo physical as well as psychological torture. But, Riddle of the Gods also brings together the least likely of soul mates, friends, and champions, who put aside their many differences and band together in an epic battle to bring liberty, justice, and freedom to the people of their galaxy. Lyra Shanti expertly brings together all the elements of the previous books. Answering questions and asking new ones, Ms. Shanti continues to build her world and her characters making them come alive to a point where I rejoiced and mourned right alongside them. I highly recommend this series and look forward to Book 4. The third book of the series didn't disappoint at all! I enjoyed reading the first two books and waiting to read also this one. I am incredibly impressed with how Shanti was able to create such a credible, almost tangible reality between planets and kingdoms. I felt engaged to read about the new challenges the main characters went through. The inner struggle of Ayn and his doubts about whether or not he is supposed to be "The Bodanya" the one who is supposed to save the Un. I was extremely intrig The third book of the series didn't disappoint at all! This is the book that took this series from good to great! Ayn has already survived the destruction of his childhood and confronted the world non gods deal with, now his faces something that each of us must overcome, his own inner demons. I enjoyed the characterization is this installment. Shanti drove much of the character building through dialogue, and this part of the epic is loaded with surprise revelations and shocking bursts of new information. If you have read the first two and are on the This is the book that took this series from good to great! Ayn has already survived the destruction of his childhood and confronted the world non gods deal with, now his faces something that each of us must overcome, his own inner demons. I enjoyed the characterization is this installment. Shanti drove much of the character building through dialogue, and this part of the epic is loaded with surprise revelations and shocking bursts of new information. If you have read the first two and are on the fence about pushing on, go for it! If you haven’t started yet, check out my reviews for the first two and then join the fun. “This was his city. It was amazing and horrible and wonderful all at once.” This is one of my favorite snippets of narrative. How cool is this book? So cool that I binged on this series in order to get my greedy oversized hands on the book 4 ARC before its release. Word. Writing reviews has its advantages. ;-) I asked the author for review copies and Shanti graciously provided tinder for the raging inferno that is my love for science fantasy. I have reviews for the entire series and all sorts of other great books at LARC-SciFi(dot)com. Buy this book if you like Voltron (Lion Force or Legendary Defender), books that explore interpersonal relationships, space, coming of age stories, or LGBTQ(…+) characters and topics. In fact, buy this book if you are afraid of LGBTQ(…+) topics. Sit alone and read the story, and think about the fact that people are people regardless of who and how they love. It’s good to challenge you own paradigm, after all. Don’t read this story until you’re a grown up, though. It’s got some hot and heavy love scenes. Another amazing addition to the series! Those of you who have read my reviews of the other two books will know that I thoroughly enjoyed them both, and the third book is just as brilliant. The pace of this one felt faster than the rest as there is so much action (or maybe it was because I couldn't stop reading). There are so many revelations in this book, I was on the edge of my seat with every reading. Better still, these revelations either make characters develop even further or explain their a Another amazing addition to the series! Those of you who have read my reviews of the other two books will know that I thoroughly enjoyed them both, and the third book is just as brilliant. The pace of this one felt faster than the rest as there is so much action (or maybe it was because I couldn't stop reading). There are so many revelations in this book, I was on the edge of my seat with every reading. Better still, these revelations either make characters develop even further or explain their actions without too much backstory to divert from the present action. Space opera of epic proportions. Continuing directly from the first two books in the series, ‘The Riddle Of The Gods’ follows the inter-planetary conflicts and politics that impact so powerfully on the lives of Ayn, Pei and Axis and their compatriots as they fight against the corruption and oppression that has placed their universe in peril. Their battles are personal as much as they are planetary, and as the drama unfolds, the urgency with which they must fight increases. Choices must be made, Space opera of epic proportions. Continuing directly from the first two books in the series, ‘The Riddle Of The Gods’ follows the inter-planetary conflicts and politics that impact so powerfully on the lives of Ayn, Pei and Axis and their compatriots as they fight against the corruption and oppression that has placed their universe in peril. Their battles are personal as much as they are planetary, and as the drama unfolds, the urgency with which they must fight increases. Choices must be made, relationships and alliances are formed, and consequences can be significant far beyond individual circumstances. Through all this, the theme of honor and loyalty is pervasive. One of the elements of this series that I really admire is the way in which Shanti leads her characters on a personal pilgrimage in which each must accept who they are as an individual before they can fulfill their destiny. It’s a powerful lesson that addresses the most crippling fear of many people: ‘Am I enough?’ in a resounding and positive way. This really is an elegantly constructed universe, and its stories are compelling. Shanti has yet again demonstrated her prowess as a world-builder and architect of complex, deeply involving characters and storylines. Shiva XIV: The Riddle of the Gods (2016) is book 3 in the series. This book brought satisfying answers to questions I had about books one and two. There is a villain in this series, Nol Yotama, who conflicted me more than any villain I can remember reading. If you've read the series I want to know if you went down the same topsy-turvy emotional path I did with him. There are relationships between these characters that most authors can't pull off, including an open-minded, naturally occurring non- Shiva XIV: The Riddle of the Gods (2016) is book 3 in the series. This book brought satisfying answers to questions I had about books one and two. There is a villain in this series, Nol Yotama, who conflicted me more than any villain I can remember reading. If you've read the series I want to know if you went down the same topsy-turvy emotional path I did with him. There are relationships between these characters that most authors can't pull off, including an open-minded, naturally occurring non-traditional relationship forming that I find exciting. Surprising love between two other characters is about to spawn a new race of beings. I didn't say who, or what, so that's not a spoiler, right? This third installment of the Shiva XIV series, Riddle of the Gods, does not disappoint. It’s full of action, betrayals, and romance. Ayn finds his true love, the Princess Ona and he also needs to take back his home on Deius. Axis is on the planet Sirin with its own problems. I love the progression of Ayn who is starting to realize his destiny. Though is he still struggling with what it all means, he is beginning to face these issues in a much more adult manner. He knows he has a strong support s This third installment of the Shiva XIV series, Riddle of the Gods, does not disappoint. It’s full of action, betrayals, and romance. Ayn finds his true love, the Princess Ona and he also needs to take back his home on Deius. Axis is on the planet Sirin with its own problems. I love the progression of Ayn who is starting to realize his destiny. Though is he still struggling with what it all means, he is beginning to face these issues in a much more adult manner. He knows he has a strong support system with the people he surrounds himself with. Can’t wait to see where Shanti takes us next. I really dont care how this series ends I lost interest half way through book two and with all of the stupidity crammed in just to sequel bait this book which tried really hard to keep me interested and the whole character discovering their power thing was probably thrown in there other then to make a fourth book I mean really I am not surprised and I am not afraid to say I will not be checking out book four or the shorts that where released which I just see as a cash-in for a no reason to exist I really dont care how this series ends I lost interest half way through book two and with all of the stupidity crammed in just to sequel bait this book which tried really hard to keep me interested and the whole character discovering their power thing was probably thrown in there other then to make a fourth book I mean really I am not surprised and I am not afraid to say I will not be checking out book four or the shorts that where released which I just see as a cash-in for a no reason to exist. Lyra Shanti, also known as Aryl Shanti, is a novelist, editor, poet, playwright, and songwriter who currently lives in Florida with partner and spouse, Timothyne, and their two insane cats. A lover of nature, animals, anime, music, theatre, movies, myths, and of course, great books, Lyra seeks inspiration from everywhere possible! Author of the award winning sci-fi series, Shiva XIV, Lyra is a dre Lyra Shanti, also known as Aryl Shanti, is a novelist, editor, poet, playwright, and songwriter who currently lives in Florida with partner and spouse, Timothyne, and their two insane cats. A lover of nature, animals, anime, music, theatre, movies, myths, and of course, great books, Lyra seeks inspiration from everywhere possible!